A historic Savannah riverside hotel puts one writer in easy striking distance of king cake ice cream, smoky barbecue, shrimp and grits, and restaurants offering upscale takes on southern cooking. 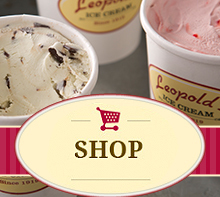 Leopold’s Ice Cream: The olde ice cream shoppe feel and history of the place—it’s been in business since 1919—are but the icing on the cake. . . or rather, the sprinkle on the scoop. With myriad fresh made ice creams, including special seasonal flavors (I had a scoop of King Cake ice cream, in honor of Mardi Gras), it’ll be months before you make your way through all the options. Check out the movie posters on the wall: current owner Stratton Leopold, the youngest son of the original founder, has produced such movies as Mission: Impossible III and The Adventures of Baron Munchausen.